Vale Industrial Estate comprises 3 industrial units, that have been refurbished and can be made available as a whole or in part subject to availability. The premises provide warehouse of steel portal frame construction with part brickwork / steel clad elevations and profile clad roof incorporating translucent roof lights. The warehouse benefits from 5.4m (17.7ft) eaves height (approx), concrete floor and high bay sodium lamps throughout and is heated by gas. An integral two storey office is constructed to the front elevation providing main reception, open plan and private offices, kitchenette and w/c’s. The offices are fitted to a good standard and provide carpeting throughout, suspended ceilings and recessed lighting. Primary loading access is by way of 2 no. electric up-and-over doors 3.6m (w) x 4.7m (h) doors to the front elevation. Externally, the property provides excellent on-site parking and a concrete service yard. The premises provide warehouse of steel portal frame construction with part brickwork / steel clad elevations and profile clad roof incorporating translucent roof lights. The warehouse benefits from 5.4m (17.7ft) eaves height (approx), concrete floor, high bay sodium lamps throughout and is heated by way of a roof-mounted gas fired heaters. An integral two storey office is constructed to the front elevation providing main reception, open plan and private offices, kitchenette and w/c’s. The offices are fitted to a good standard and provide carpeting throughout, suspended ceilings and recessed lighting. Primary loading access is by way of 2 no. electric up-and-over doors 3.6m (w) x 4.7m (h) doors to the front elevation. Externally, the property provides excellent on-site parking and a concrete service yard. The properties are available as a whole or separately by way of a full new repairing and insuring lease for a term of years to be agreed. Alternatively, the whole of the property (only) could be made available on a freehold basis. RV 2017 (Warehouse & Premises) - £114,000. 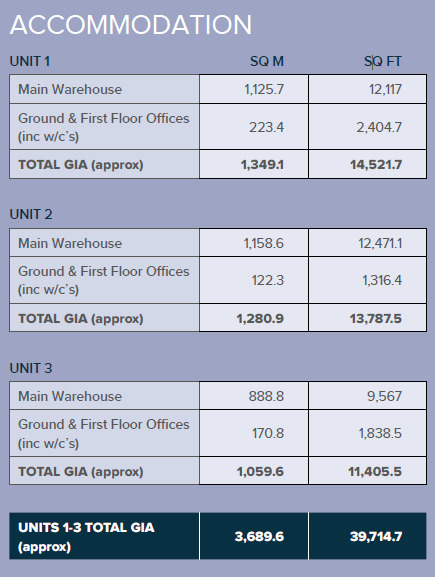 Note: should the units be let individually, the Rateable Value assessment will be adjusted as appropriate.